Yes, Ireland in winter is a little less green. Trees are bare, trails turn muddy, and the sun disappears earlier in the day. But if you’re someone who enjoys crisp beach walks and crackling fires, the colder months are an ideal time to explore. For starters, it never gets too cold to enjoy the outdoors. Ireland’s temperate climate rarely falls below freezing and snow is an unexpected treat, rather than a regular occurrence. Heritage sites are quieter, hotels are cheaper, and there’s no better time to cosy up in a local pub. So as long as you wrap up well and don’t mind a bit of rain, visiting Ireland in winter can be a wonderful experience. 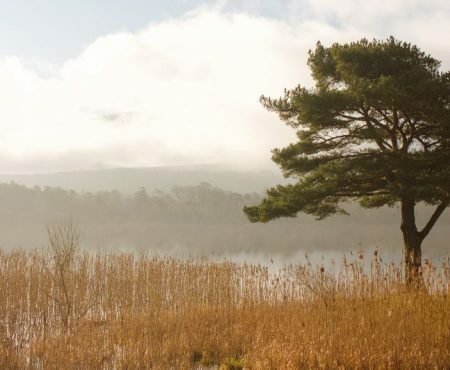 Winter is a wonderful time to visit Ireland’s national parks. Fewer visitors mean quieter trails, so exploring Ireland’s most dramatic landscapes becomes even more tranquil. In Connemara, the Burren National Park is 1500 hectares of limestone rock, wildflowers, and sheer cliffs. Seven way-marked trails weave through the park, making it easy to explore. But the park’s information centre is closed from October – March, so plan ahead and download a map or two. The winter months are also an ideal time to visit the nearby Cliffs of Moher. Typically thronged with visitors in summer, there’s something extra-special about experiencing the cliffs at their quietest. Meanwhile, in Co. Kerry, Killarney National Park is extremely popular. So winter is the most peaceful time to visit, when you can still wander through its ancient forests and loop around the lakes. Just remember that winter days are shorter, so you’ll have to maximise your time. The winter solstice is infused with a sense of mystery and magic. Signifying the shortest day of the year in the Northern Hemisphere, winter solstice usually falls on December 21st or 22nd. And there’s no better place to witness the natural light show than Newgrange, a megalithic passage tomb in County Meath. The annual Newgrange celebration is one of the most famous winter solstice events in the world. It’s so popular that tickets are only available via a free lottery. But if you’re visiting Ireland in December, it’s definitely worth a try. If you don’t get lucky in the lottery, head to the nearby Loughcrew Cairns. Lesser-known than Newgrange, Loughcrew is full of ancient history and free of crowds. In Loughcrew, a quiet corner of Meath, four cairns sit on three velvety green hilltops. The March equinox is a wonderful – but busier – time to go when the rising sun illuminates ancient carvings in Cairn T.
January and February are prime months for a refresh, while the new year motivation is still going strong. If you’d like to get started in yoga or improve an existing practice, a yoga weekend is a great way to dive in. Burren Yoga Centre runs retreats in a wild part of Ireland. From gentle Yin weekends to invigorating Vinyasa, Burren Yoga offers an impressive mix of yoga styles. If meditation retreats are more your style, Dzogchen Beara Buddhist Retreat Centre is a gorgeous place to spend a few days. An inclusive and welcoming centre, Dzogchen Beara sits on the cliffs of the Beara Peninsula in County Cork. The themed retreats, which run throughout the year, each have a different focus. Or if you only have a few hours to spare, the ‘Open Mind – Open Heart’ drop-in meditation sessions are a wonderful taster. Winter is the perfect time for hunkering down and enjoying Ireland’s cosy pubs, soul-warming food, and dreamy hotels. From twinkling lights to the smell of freshly-baked soda bread, it’s the season for enjoying indoor comforts. Head to Cork and wander around the English Market, sampling treats from local producers. Book a table at Cafe Paradiso for an indulgent, plant-based dinner or spend an evening in Arthur Mayne’s, one of the city’s cosiest wine bars. In Galway, you can wander the narrow, cobbled streets to a backdrop of live music. Spend a night dancing in the Roisin Dubh, before recovering the next morning with a delicious brunch on at An Bia. 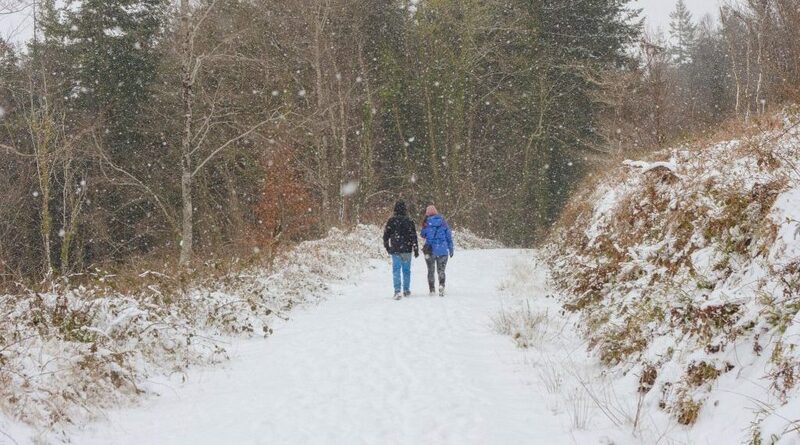 If you’re looking for peace and fresh air, then you’ll love hiking in Ireland in winter. Thanks to Ireland’s mild winters, it’s rarely too snowy to go exploring. But you’ll need to keep an eye on the weather and be prepared to change your plans. For exhilarating views, head to Torc Mountain in Kerry. A rocky trail winds all the way to the summit, making Torc a brilliantly accessible mountain for even novice hikers. In Wicklow, the Camaderry Loop Walk is a gorgeous cold weather hike. Mountain deer roam the valley in winter and wild goats occasionally pop up around the trail. The walk begins at Glendalough Upper Lake, then passes through Glenealo Valley before stretching up to the summit of Camaderry Mountain. Due to Ireland’s mild winters, smaller mountains aren’t typically snow-capped. But you’ll still need hiking boots and waterproof clothing to stay safe and comfortable. Scattered off the coast of Ireland, rocky islands rise out of the sea. Some islands are easier to reach than others, and some have no inhabitants at all, but each one offers a glimpse of Ireland at its wildest. The Aran Islands, off County Galway, are probably the most famous of the islands. Inis Mór is the biggest of the Aran Islands, while Inis Meáin and Inis Oírr offer remote tranquillity. Rugged, but welcoming, the Aran Islands have managed to preserve old Irish culture, while embracing the new. The Blaskets, uninhabited islands off the coast of County Kerry, are equally fascinating. Take a tour to explore their deserted villages, old stone cottages, and sandy shores. After a day of exploring frosty forests and wintry beaches, there’s nothing better than warming up over a nourishing meal. 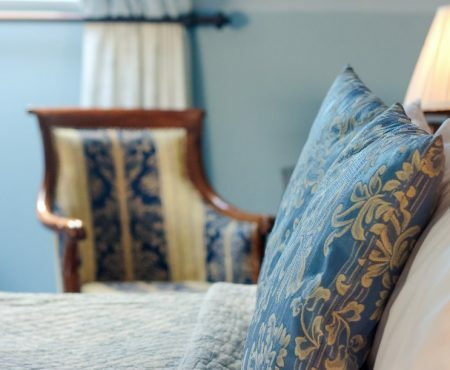 For the ultimate Irish foodie experience, book a stay at Dunbrody House in Co. Waterford. Set in a restored Georgian manor estate, Dunbrody is a luxury hotel and cookery school. But don’t expect stuffy formality here – Dunbrody is all crackling fires, comfy armchairs, and delicious, locally-sourced food. The cookery school runs a mix of courses and workshops throughout the year. So you can learn to make anything from hearty pies to delicate desserts. And if cooking lessons sound like too much work, you can sit back and indulge in The Harvest Room’s incredible menu. As Dubrody’s elegant restaurant, The Harvest Room focuses on seasonal dishes, prepared with the freshest ingredients. Winter in Ireland is a time of gentle sunsets, wild waves, and hair-whipping winds. So grab a coat and make your way to the coast for a chilly beach adventure. At Garretstown Beach in Cork, an old favourite of mine, you can rent surfboards and wetsuits and brave the winter sea. 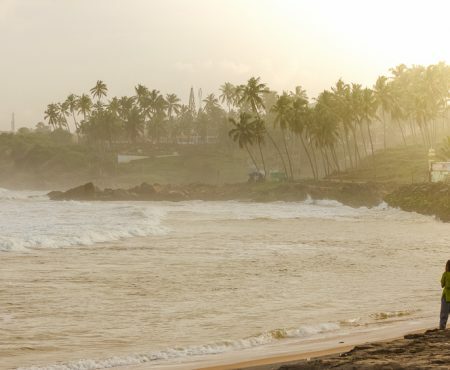 Gtown Surf School opens whenever the weather is suitable and the beach is popular with beginner surfers. Or for a calmer coastal experience, take a trip up Ireland’s Copper Coast. Arguably one of the most beautiful places to visit in Ireland in winter, the Copper Coast became a UNESCO Global Geopark in 2001. Dramatic beaches punctuate this stretch of the Co. Waterford coastline, interspersed with rocky headlands and pretty villages. As Europe’s longest coastal drive, the Wild Atlantic Way has made quite the name for itself. And for me, this winding route definitely lives up to the hype. Passing through nine counties altogether, the Wild Atlantic Way takes you past secluded coves, through vibrant towns, and over towering mountain passes. And when it comes to routes, the options are endless. For wild waves and remote islands, spend a week driving through counties Mayo and Sligo. Or if rugged mountains and sparkling lakes are on your mind, start in Co. Kerry. Wild Atlantic Way is a good place to start for planning your Ireland winter itinerary. Steam, soak, and sleep your way to total bliss in one of Ireland’s dreamy spa hotels. When the weather is miserable and motivation is at an all-time low, a winter spa weekend is a wonderful way to re-energise. At Cliff House Hotel, a five-star boutique hotel in Ardmore, you can start your day with a swim in the infinity-edge pool. With expansive views of the Irish Sea, it’s truly a pool like no other. And later, let your therapist do the work while you enjoy the hotel’s signature ‘Out to Sea’ treatment. And after a day of exploring, unwind in an organic seaweed bath on the outdoor relaxation terrace. In Dublin, relax in the cocoon-like interior of The Marker’s Spa and Wellness Centre. Ease your winter tension in the eucalyptus-infused steam room or surround yourself with bubbles in the giant jacuzzi. Planning to explore Ireland in winter? The sun sets as early as 4 pm in December but stretches to 6 pm in February. Driving in Ireland in winter is generally straightforward, as the weather is typically mild. During times of ice and snow, make sure to check the weather forecast and road warnings for latest updates. If you’re worried about exploring Ireland in winter weather, don’t be! Pack warm, waterproof clothes and you’ll be fine.